Lab animal technicians study and care for a variety of animals involved in research programs. 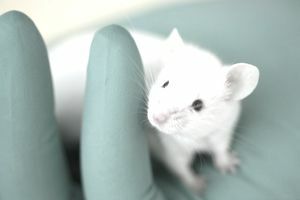 They are responsible for providing basic care to lab animals such as mice, rats, reptiles, dogs, and primates. People in this position have a lot of compassion for lab animals and their well-being, and treat them humanely and with respect. Lab animal technicians may also assist ​veterinarians and researchers with handling animals for examinations and procedures. Lab animal technicians must ensure that their facility complies with all animal welfare guidelines and standards set forth by the Animal Welfare Act, the Institutional Animal Care and Use Committees (IACUC), and the National Institute of Health’s Guide for the Use and Care of Laboratory Animals. Facilities are subject to inspections to ensure maintenance of proper conditions. Education: A high school diploma is generally the minimum educational requirement for becoming a lab animal technician, but many in the field hold an associate or bachelor's degree in animal science, biology, or a related area. Courses: Degrees in these fields usually include coursework in animal science, genetics, anatomy, physiology, nutrition, biology, chemistry, mathematics, and communications. Experience: Lab animal technicians may have gained useful prior experience by working as a veterinary technician or veterinary assistant. Veterinary technicians have the opportunity to develop advanced skills by handling a variety of species, administering medications, and operating medical devices. Lab animal technicians may also have gained valuable experience during the course of their college studies, as most college science programs place a heavy emphasis on lab components. Certification: Professionals highly recommend industry certification, as it enhances salary and career prospects for lab animal technicians. The American Association for Laboratory Animal Science (AALAS) offers three certification paths: Assistant Laboratory Animal Technician (ALAT), Laboratory Animal Technician (LAT), and Laboratory Animal Technologist (LATG). Those seeking certification must meet minimum educational and work experience requirements before becoming eligible to take the exam. Continuing education: Once certified, lab animal technicians must complete continuing education unit (CEU) hours to maintain their certification. This educational requirement ensures that certified lab animal technicians are aware of the most current information regarding emerging techniques in the field of laboratory animal science. CEU credit hours can be earned by attending lectures, participating in training courses, and completing workshops. Lab animal technicians may find employment in a wide variety of laboratory settings in the private and public sectors. Positions are available at colleges, universities, veterinary or medical schools, government agencies, military labs, private research facilities, biotechnology companies, pharmaceutical companies, and other organizations concerned with research. Technicians may also advance to a management role in their research facility after obtaining the necessary experience and certification. The AALAS offers a Certified Manager Animal Resources (CMAR) certification program for those seeking to qualify for management positions in their laboratory. Compassionate: Being kind and humane is important in working with animals involved in scientific research. Patient: Being patient helps to calm nervous or frightened animals during testing or if they are ill.
Observant: Accurately assessing the habits, behavior, and physical appearance of an animal is important to obtaining accurate research findings. Critical thinking: Properly evaluating the facts and information relative to the research being conducted is important for coming to an accurate conclusion. Interpersonal: Having strong relationship skills allows technicians to work effectively with scientists, assistants, and others involved in animal research. Verbal and written communication: Describing and recording observations, calculations, and findings clearly and accurately is key. Strength and endurance: Being physically fit is necessary, as animals may need to be manipulated or lifted, as well as heavy medical equipment and instruments. According to the U.S. Bureau of Labor Statistics, job prospects for those in the field will increase by 20 percent from 2016 to 2026. With the rapid expansion of the biotechnology industry, the need for lab animal technicians is expected to be strong for the foreseeable future. Lab animal technology offers a stable career path for those willing and able to work with animals kept in a research environment. Lab animal technicians typically work in private clinics and animal hospitals. They also may work in laboratories, colleges and universities, and humane societies. They may risk injury on the job while holding, cleaning, or restraining an animal. Many clinics and laboratories are staffed 24 hours a day. As a result, hours may include evenings, weekends, or holidays. Look at popular job boards such as iHireVeterinary, Indeed, CareerBuilder, and Monster. These sites also offer tips on resume and cover letter writing, as well as techniques for getting and mastering an interview.